Link Shell Extension is a free tool which enables Windows users to use hard links or symbolic links, something UNIX users have been doing for eons. The advantages of linking files and directories are vast and can even be useful for backing up files or simply providing your PC with a little assistance when finding a file. 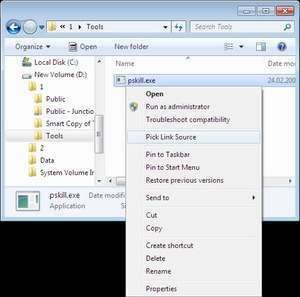 Link Shell Extension installs on your system and then adds some options to the Windows Explorer context menus. From there, you can select the link source and then link a file or folder to another location, perhaps an external or second internal hard drive with your mouse. Version 3.9.2.1 is a freeware program which does not have restrictions and it's free so it doesn't cost anything. For security reasons, you should also check out the Link Shell Extension download at LO4D.com which includes virus and malware tests. Additional screenshots of this application download may be available, too.